Cardiac transplantation is the treatment of choice for patients with end-stage heart failure. Long-term prognosis and survival after heart transplantation is related to cardiac allograft vasculopathy (CAV), renal failure, and malignancy. Cardiac CT, particularly using latest generation equipment, is a unique imaging modality that allows the assessment of posttransplant anatomy and the detection of early and late complications related to the procedure. Coronary artery lumen and wall are now viewed and analyzed with unprecedented anatomical detail, whereas specific CT acquisition modes also enable the evaluation of cardiac morphologic and functional parameters in good agreement with established imaging modalities. 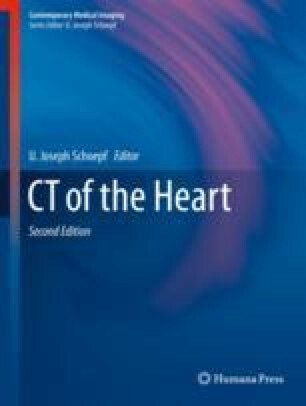 Although conventional coronary angiography remains the reference standard for the diagnosis of CAV, the results of most recent studies and meta-analysis suggest that CCTA could be considered as an alternative to conventional coronary angiography in the routine surveillance of heart transplant recipients. However, further research is warranted to determine the impact of this imaging technology in the management and clinical outcomes of this patient population.